Forty-four stone steps lead one from the sidewalk to the door of the hotel. it is an ancient building consisting of a ground floor with a nightclub called Cuba Libre, a first floor with the New Lebanon Hotel, and a second floor that tells a tale whose end is destruction. Its ceilings are seven meters high, and from it one looks directly onto a public highway that leads to Beirut’s glittering commercial center. From the outside the building looks forgotten, half-hidden, an odd man out in an explosion of renewal. The reason lies in the owners’ refusing to rehabilitate the place after the war, in hopes that their tenant would vacate the lot. Then they could build two or more modern apartment blocks that would bring in high rents and dollars in place of the meager sum in liras paid by Umar Dhuqan Nasr. The relationship of the Nasr family with one of the floors of this building owned by the Hommosi family dates back to 1953. Dhuqan Nasr’s father came to Beirut from the village of Kafar Nabrakh in the Chouf Mountains. He came with his son, hoping to find the boy a reliable business, the proceeds from which he could use one day to build himself a house in the village. Back then he rented the hotel for the sum of twelve thousand Lebanese liras annually; today, the rent has risen to 1.5 million liras ($1,666) per year. Dhuqan opened the door, and rooms, of the New Lebanon Hotel. In a single room, a multitude would sleep: day laborers and students and whole families alongside them; Lebanese, Syrians, and Egyptians. Everyone who knocked on the door found a welcome. With the start of the civil war in 1975, Dhuqan, father to five boys and three girls, continued to run the dormitory hotel, finding a sense of security in its proximity to the house of the founder and head of the Kataeb Party, Pierre Gemayel. This protection did not last long, however, for Gemayel left the area, and his comrades from the same neighborhood left with him. The party leadership replaced them with young men newly arrived at the critical battlefield of the capital. These incoming armed men weren’t neighbors, which meant that the hotel was exposed to theft and attack, to say nothing of the shelling — the huge building stands precisely halfway between a Muslim street and a Christian street. Thus Dhuqan Nasr, son of the mountains, found himself, quite literally, between two fires, against which his hotel was without defense. And so one dark night, during a bombardment, the family fled to the village, bringing only the clothes on their backs. Elias Abu Hatim, on the other hand, who had been staying in the hotel since long before the war and who taught at a Beirut school, never abandoned his room. Everything in the hotel had been stolen — doors, beds, washbasins, faucets — and yet Abu Hatim would come back every night to sleep. When Umar Dhuqan returned at the end of the war, he found Elias, still in residence, waiting for him. Abu Hatim’s tenancy only ended when the Red Cross moved him, at an advanced age, to a nursing home. Umar recounts that the man was a brilliant mathematician, lived on what he made as a schoolteacher and from private lessons, and went his entire life without a partner. He never washed his clothes but would wear them and then throw them away, he had so much money and so little to spend it on. The tenant on the third floor was Charles Helou, a name that Lebanon has not forgotten. Helou, president of the Lebanese Republic from September 23, 1964, to September 22, 1970, moved from his home above the New Lebanon Hotel to the presidential palace as soon as he was elected, and his brother, Antoine, took up residence, remaining the hotel’s neighbor until he contracted heart disease and the doctor told him that climbing forty-four steps every day might kill him. The Helou family maintained their lease and allowed the hotel to use the rooms of their house. The roof tiles on the third story, however, suffered greatly during the war. The property owners obtained an order for its demolition and did indeed demolish it over the objections of the hotel, which the Nasr family went to court to keep in their name, despite its ruined state. It is indeed his home. He lives in it with his wife and two children. Yasmin is studying special education at the Jesuit University, and his son, Sallam, is pursuing his baccalaureate. They occupy three of the hotel’s twelve rooms (one of which is kept “on standby,” as Umar puts it, in case an old customer should turn up during a busy period — he says he never turns an old customer away, ever). Umar has gone to great lengths to be able to choose the sort of customer he wants. He says that the cost of renovation forced him to house the same types of people his father had — workers, Syrian, Lebanese, and Egyptian, together in one room, robbing one another and brandishing knives and guns. However, once the renovation was finished, Umar started telling any worker who came to him that the hotel had become a private dormitory for students, to avoid unpleasantness. A few months went by and excuse became fact, with the hotel giving university students a bed for one hundred dollars a month. Over time, Umar stopped renting beds, and now he rents only rooms, the rate varying from twenty to twenty-five dollars a night, depending on the guest’s financial situation. Today the hotel has become a destination for a type of person — Lebanese, Arab, or foreign — that Umar describes as “decent”: a bank employee, an aged millionaire, a Yemeni doctor, a French circus troupe, a businessmen from Aleppo. The bank employee is twenty-eight years old. He has been living at the hotel for nine years. He came as a guest with his father; then the father died and the son, who lacked any higher educational qualifications, stayed on. The bank’s owner took pity on him and gave him a job, and the Dhuqans took pity on him and shared their food and daily lives with him, till he became a part of the family. A few days ago he bought a car, Umar proudly announced to me during our conversation. In any case, Umar prefers that his guests remain in their rooms. The main hall around which the hotel’s rooms are arranged is no longer a shared meeting space. 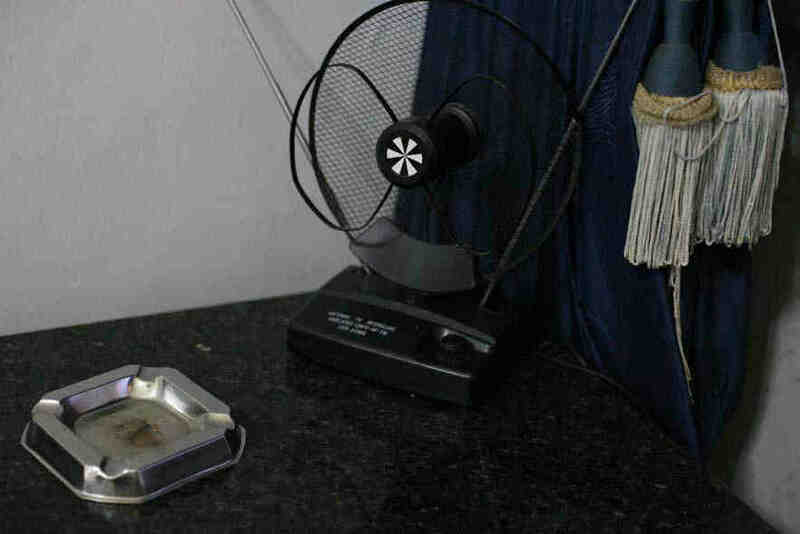 He removed two television sets because of political quarrels that didn’t end well and went to the expense of putting a television in each room. This means that each room is now furnished with two beds, two couches, a fan, a carpet, a table, and a television. 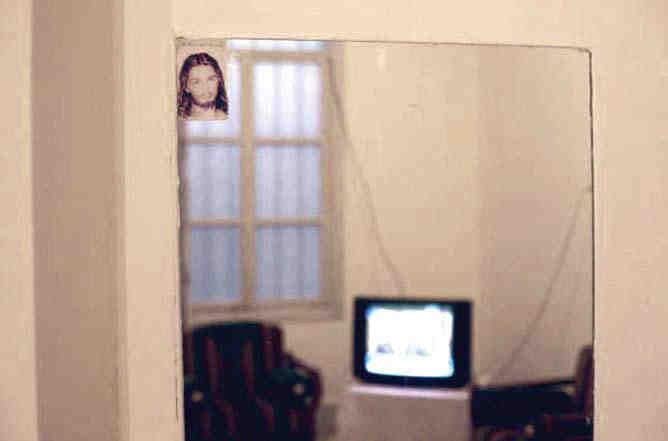 The furnishings of the rooms resemble those of nearly every Lebanese grandfather’s house, a place where one can recall memories too large to be held in its four walls, a place where one can find the kind of peace in which to sit at ease, surrendering oneself to a private past within a public space — a strange feeling that induces a smile of complicity. On the threshold of the hotel, on the side facing away from the public highway, I found myself looking out over the details of a life spun within a narrow space, a life with its heroes living and dead — a pool without water, a garden consisting of no more than a loquat tree and a jasmine bush, an abandoned room made of tin sheeting obscured in the shade cast by the neighboring bars. The New Lebanon is located between two streets that enjoyed some commercial renown in the 1990s. But Rue Monot is no longer the center of Beiruti nightlife, that title having been stolen from it by Rue Gemayze. And Tariq al-Wasat’s commercial sparkle has never quite returned after all the demonstrations and funerals that passed along its bounds, especially since the opposition’s tent-city sprung up there. The hotel thus sits between two streets that helped define the “new” Lebanon in the years following the civil war. And yet at the New Lebanon, you see old Lebanon and smile, lost in an easy oblivion of quiet dreams.